Sassy Cheryl's Digi Stamps Challenge Blog: Challenge #144-I'm Dreaming of a WHITE CHRISTMAS!!!!! 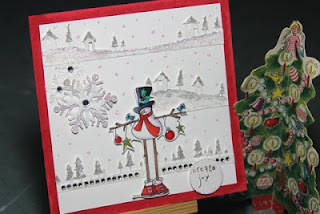 Challenge #144-I'm Dreaming of a WHITE CHRISTMAS!!!!! Hello Sassettes! We hope that all of you are having a fabulous week. Can you believe we are already into December and Christmas is only 21 days away!!! Wow! I sure hope you've been good this year because it may be too late to get on Santa's GOOD list. 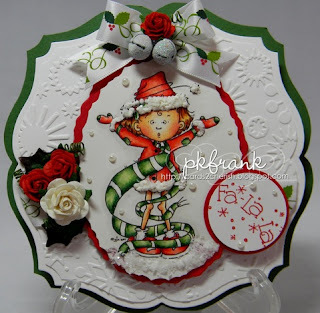 We all enjoyed the wonderful cards that each of you created for the Sketch challenge last week. Each of them were just beautiful and showcased such fabulous coloring. Loved them all! Thanks to everyone who played along!!! 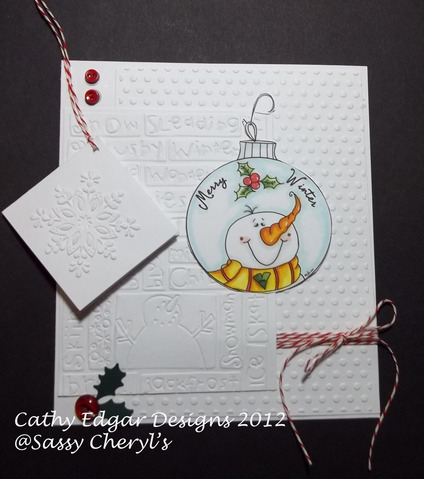 So, let's get to the winner of last weeks challenge and the lucky winner of TWO FREE IMAGES from the Sassy Cheryl's Digis shop. That winner was. 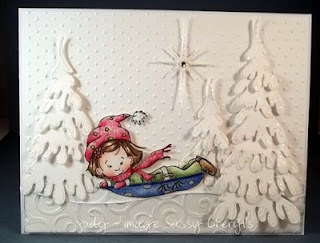 . . .. .
Just look at her fabulous Christmas card. Isn't it lovely!!! I LOVE the way she colored the snowman and those adorable snowflakes. Just beautiful!!. CONGRATULATIONS Mz. Fairysparkle!!!!! 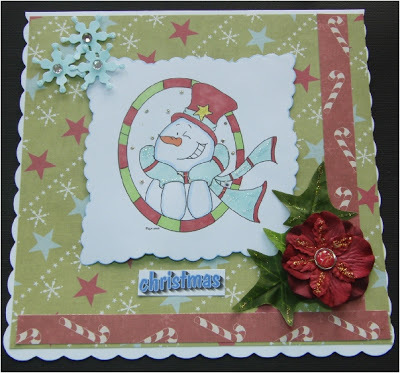 I'll credit your account this morning with the TWO FREE images from the Sassy Cheryl's Digis shop so you can do some shopping!!!! We hope to see you play along again this week! Sassy Jackie is our hostess again this week with another fun and appropriate challenge. . . . .What is it you ask? Well this weeks challenge is. . . .
Oh, how fun! And we can't wait to see what you're going to create for us. Need a little inspiration to get started? Well then, just check out what the fabulous and wonderful Sassy Design Team put together for you this week. WOW!!!!!!! Aren't you inspired?!?!?!?!?!?! So come and play along. . . .just remember that you are now required to use a Sassy Cheryl's image to participate. 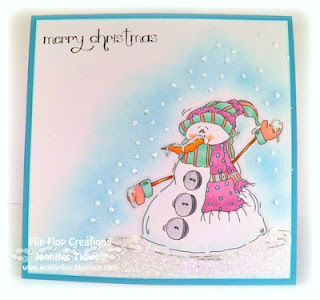 You'll have until 5 PM EST, Monday, December 10th., to link up your image or blog to be entered in the random drawing for the TWO FREE IMAGES. Can't wait to see. . . . because I think most of us are really dreaming for .. . . . .
CONGRATS Mz. Fairysparkle!!!! Got your account all credited so you can go shopping! Hope you'll play along again this week! Jackie. . . another great theme for the challenge and ladies......gorgeous as always! Oh my goodness, these cards are amazing. 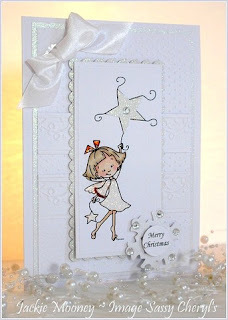 I love white on white, so a wonderful challenge, and the DT cards are simply amazing. wow! wow! wow! All the DT cards are just stunning! LOVE this theme! Will have to see if I can come up with something! Lovely inspiration from the design team, as always. 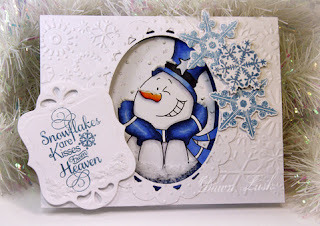 Thanks to everyone who played in this weeks WHITE CHRISTMAS challenge! Good luck in the drawing. . . .hope to see you join in again next week!